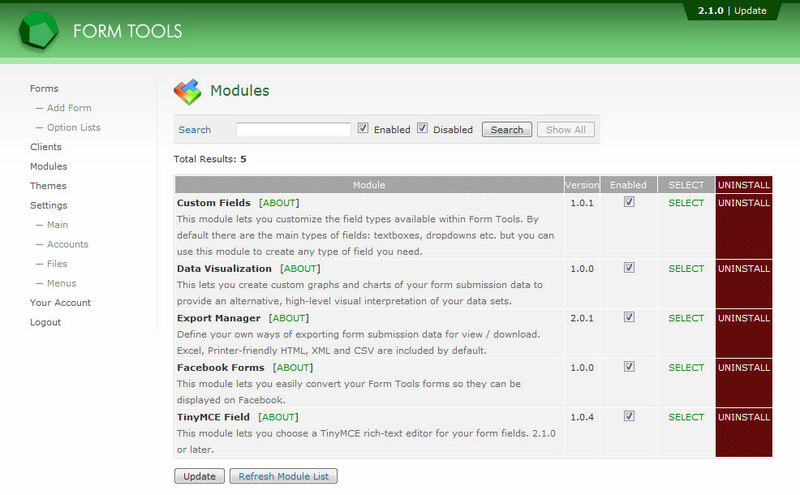 Form Tools was designed to be modular. The Form Tools Core includes all the necessary functionality to create and manage your forms, but most of the really cool stuff is found in the modules. All modules are entirely optional: you can pick and choose what additional functionality you need. For convenience, the main download files include the most commonly requested modules, but you can always go ahead and uninstall them if you don't need them. The modules are all listed here. Check 'em out! There's lots of great functionality available! Sort. The module name and "enabled" columns are sortable - click them twice to reverse sort by that column. Search. The search field at the top of the page searches all aspects of the module and returns the subset found. As of 2.1.0, you can also search by Enabled / Disabled. 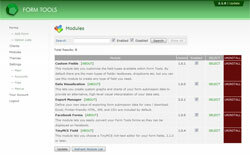 By default, the modules page lists 10 modules per page. But if you feel this is too many or too few, you can edit that value on the Settings » Main tab. Often, you may find yourself using a module so often that having to it can get annoying having to click through the Modules page just to get to the module. To get around this, you might want to consider adding a direct link to the module in your menu navigation. You can read about customizing the menus here.